ESPN’s Adam Schefter reports that the Philadelphia Eagles have signed interior-defensive lineman Tim Jernigan to a $48M extension, which will keep him under contract until 2021. 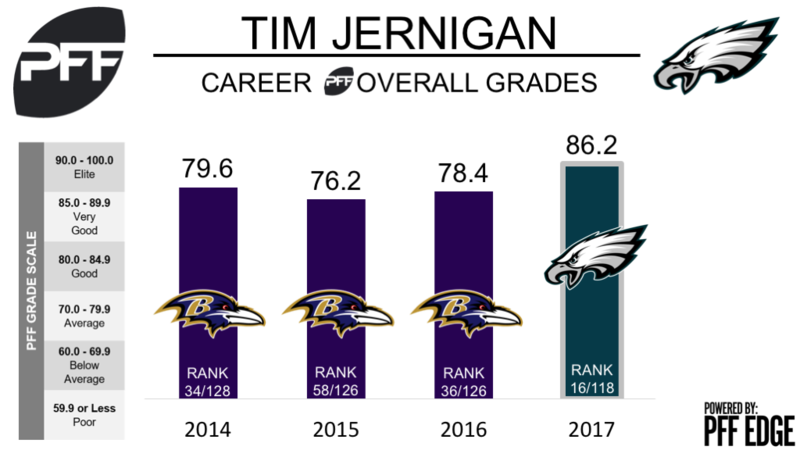 The Eagles acquired Jernigan via a trade with the Baltimore Ravens in the offseason, and he’s been a vital part of the team’s front seven so far this year. Through the team’s first nine games, he’s played 52.2 percent of his team’s defensive snaps and his current overall grade of 86.2 ranks 16th among 118 qualifying interior-linemen. Jernigan has made a name for himself against the run over the last few seasons. In 2016, he ended the campaign ranked first among all 3-4 defensive ends with a run stop percentage of 10.8 percent, and this year, his run stop percentage of 7.9 percent ranks 24th among defensive tackles. While there is a slight drop off in numbers from a season ago, he’s still graded well in run defense, and has attained a run defense grade of 86.5, good for 13th among players at the position. Jernigan has also been productive in the pass-rush. Over the last nine games he’s played a total of 196 pass-rush snaps and produced two sacks, five hits and 10 hurries, resulting in a pass-rush productivity of 6.8, good for 16th among defensive tackles.